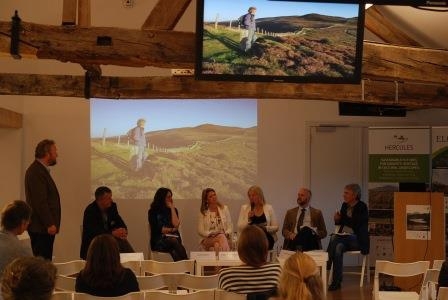 A range of labelling approaches exists in Europe that influences the way and the objectives of landscape management in form of eco-certification and stewardship approaches, regional brands and geographic indications. Even though their linkages to sustainable landscape management often remains implicit, mostly focusing on the provision of single landscape services and/or product quality and production processes, these labels serve as an expression of concern about sustainable production and the importance of landscape for culture, tradition and locality. As such, they help bringing the uniqueness of landscapes, their products and management into socio-political debate. Labelling inherently draw on the idea of multi-functionality of landscapes. They serve as mechanisms for sustainable land use and management according to principles for environmentally appropriate, socially beneficial and economically viable land management and production processes. For their establishment und use, they need to build on integrative mechanisms for inter-sectoral coordination, multi-stakeholder participation and collaboration. Broadening the focus from certifying single products, services and production processes to an entire landscape, it offers possibilities for developing regional visions by a range of societal actors carrying the process. Thus, it is important to that take stakeholders’ judgments and perceptions for co-management and planning into account. Labelling holds the potential of re-linking social, cultural and environmental characteristics of landscapes. They permit regional actors, landscape managers as well as producers to improve market recognition by establishing territorially embedded value chains, to gain access to niche markets, and attain market benefits for typical regional products and production practices. As such, labelling can serve as platforms for collaboration. However, ensuring effective and trust-based interactions among regional actors is not an easy task. Labelling has to cope with ambiguous goals, visions and conflicts, hence, trade-offs have to be taken into account and/or revealed over time. This demands for transparent and reflexive processes as well as for suitable communication strategies. Labelling is one approach within a set of policy instruments and strategies for landscape governance that ideally balance each other’s strength and weaknesses. Integrating labelling into existing procedures and standards like for geographic indication or organic agriculture could be a way forward for encountering critiques of establishing just another label. It broadens existing initiatives by a focus on integrated landscape management which takes international recognition of place-based certificates into account while building on incentive-based financing mechanisms. However, standardised procedures may also limit labels capacity for taking the uniqueness of landscapes appropriately into account, demanding for adaptation and flexibility. In the workshop, there was a general understanding on the need for additional research on how to develop procedures which can upscale existing labels and on how to create new labels which promote sustainable landscape management. Nevertheless, many labelling approaches are set up and used on different levels and by different actors, providing a rich basis for experimentation, exchange and learning. Prospectively, it is challenging but worthwhile collecting the information out there for a structured evaluation and mutual exchange on their potentials and governance strategies needed for their sustainable uses.